Capturing the ebullience, idealism and confidence of the European modern masters in the late 19th century and early years of the 20th century – among them Monet, Cézanne, Matisse, Picasso and Gauguin, and their equally celebrated Russian contemporaries Kandinsky and Malevich – are 65 paintings travelling to the Art Gallery of New South Wales from the State Hermitage Museum in St Petersburg for the Sydney International Art Series exhibition, Masters of modern art from the Hermitage . 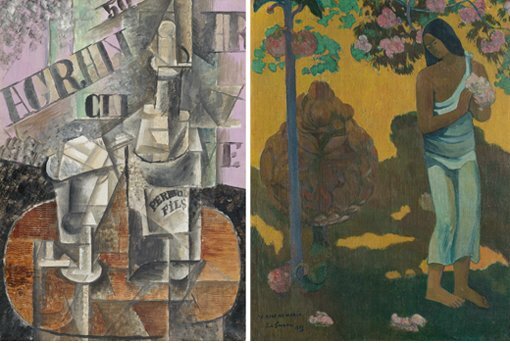 Significant works in the exhibition include Monet’s Poppy field c1890; Cézanne’s Great pine near Aix , 1895/97; Picasso’s Table in a Cafe , 1912; Gauguin’s Month of Mary 1899; Matisse’s Nymph and Satyr 1908; Kandinsky’s Landscape near Dünaberg 1913 and Malevich’s Black Square c.1932, all of which are from the Hermitage’s illustrious modern collection, now housed in the renovated General Staff Building across Palace Square from the Winter Palace, one of the most famous architectural monuments in St Petersburg. “The Hermitage continues to create its own map of modern art, art which is in fact an inseparable part of its tradition, part of its DNA. And there is nothing unusual in us having a collection of modern art. For was not contemporary art collected by Catherine the Great, by Nicholas the First and by Alexander the Third?” Piotrovsky said.